Paradise has fallen. At least, if you consider the tropical islands of Hawaii to be paradise. Anyways, sometime in the future, or maybe transcendent of time, Bad Stuff™ has happened, resulting in the destruction of modern civilization as we know it. At least, on the islands of Hawaii. But you, the players, are intrepid explorers venturing into these once lost but now rediscovered islands, braving deadly mists, native tribes, and powerful storms to be the first to re-discover the world that was. Okay, I pretty much made that up, or rather extrapolated from the box-back description, the island names, and the art on the cover, because there is no backstory written in the rulebook. 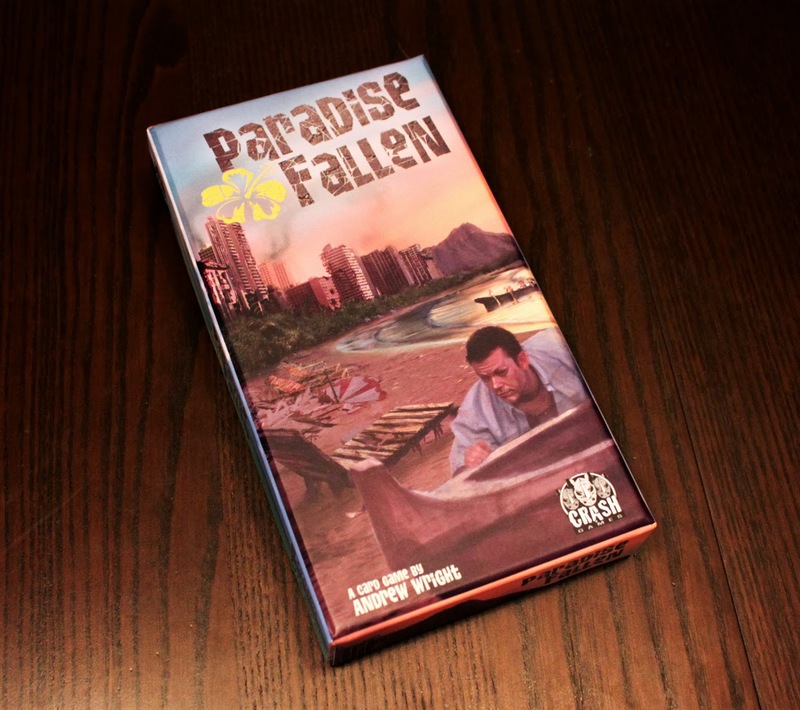 Paradise Fallen is a quick card game of island exploration for 2-4 players. The game “board” is made up of 9 Island cards dealt randomly into a 3×3 grid (the 9 islands are always the same, but their geographical relationship to each other is what changes). Then, players will take turns playing cards until someone explores a majority of the islands. Time to explore the islands! 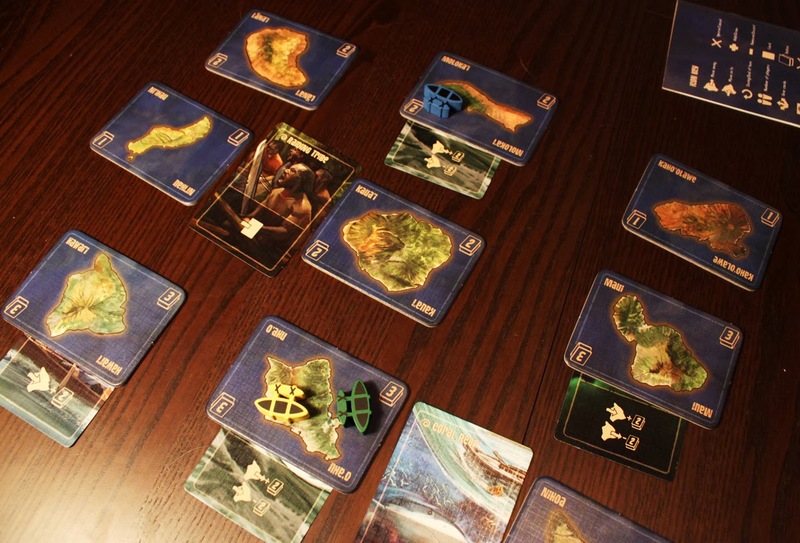 During their turn, players can play Aberrations which are dangers players must face when traveling between the islands, which generally (but not always) hinder passage. 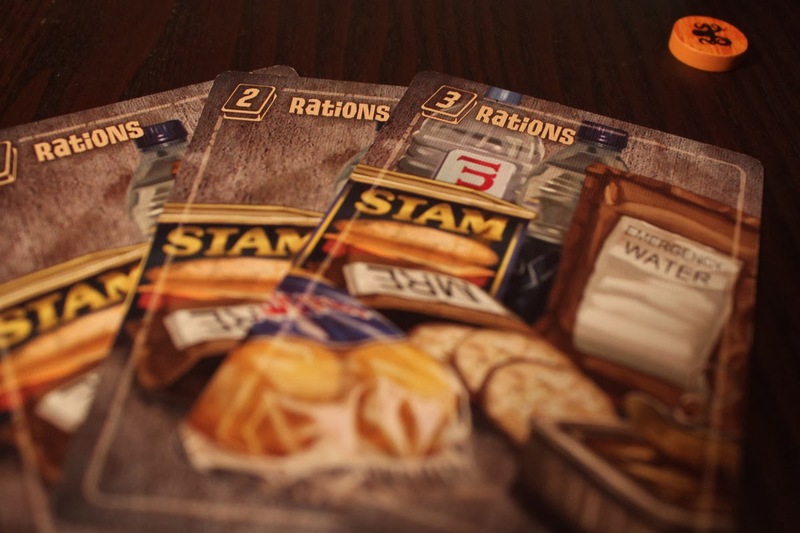 To move from Island to Island, players must discard Ration cards equal to the ration cost of each Island passed through or ending on. 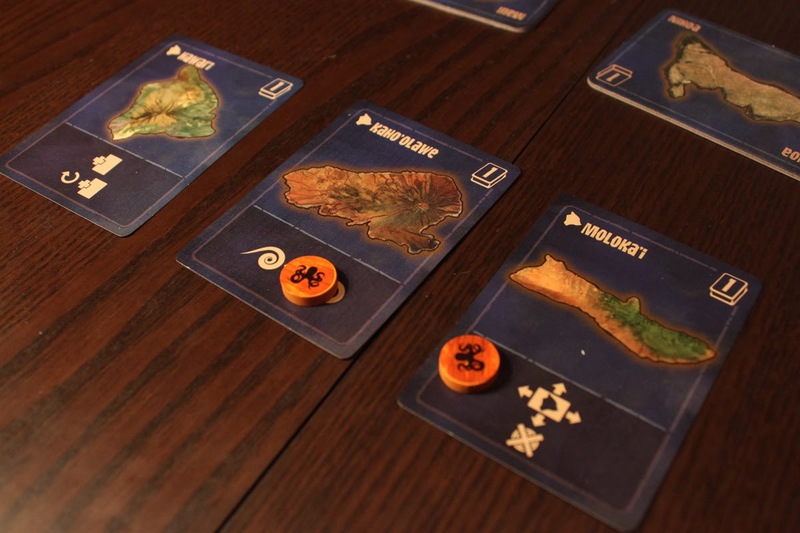 And, for the core of the game, exploration, Players must play an Exploration card matching their current Island. When an Exploration card is played, it stays face-up in front of the player and receives a Kanaloa token. This token can be spent to activate the special power on the Exploration card, but they also serve as tie-breakers at the end of the game. 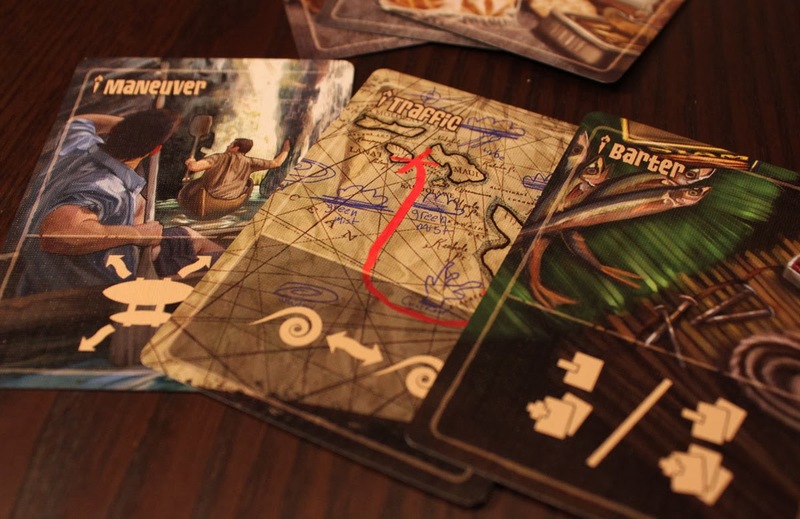 Players also have Aptitude cards which can help them traverse the islands safely. Bonuses include swapping Aberration cards, freeing up movement, drawing extra cards, and a few other variations on these activities. Aberration cards force players to discard cards from their hand in order to cross, or they can add or subtract the amount of Rations needed to travel certain paths. As I said, the game end is triggered when one player explores enough of the Islands, but each player gets an equal number of turns before game ends. Whoever has explored the most islands wins the game; if there is a tie, whoever has the most Kanaloa tokens claims the victory! Use the power of Kanaloa, whatever that is! Island Paradise or Lost Island?Paradise Fallen is not designed with incredibly deep gameplay, nor is it saturated with theme. It’s meant to be a quick, entertaining card game, and in that it does fairly well. In about 20 minutes, you can travel across several islands in your outrigger canoe (or blimp, depending on how you orient your token), face off against native tribes, get lost in swirling green mist, and escape a whirlpool or two. That’s not bad for an adventure, however abstract it all works out to be. 20 minutes is about as long as this game can sustain itself, though, and it is possible for it to start to drag if players get bogged down trying to analyze every possible combination of powers and paths. Usually that only happens on the last turn when the last player has a chance of overcoming the player who triggered the game end, but it can bring a climactic end to a grounding halt. The most interesting and enjoyable part of the game is the application of Aberrations. While most hinder progress, some actually make it cheaper to enter or leave the island they are attached to, and several Exploration abilities as well as Aptitude cards allow you to move, modify, or skip over Aberrations. You can put together some pretty cleverly-crafted turns by swapping Aberrations to travel to an island for next to no cost, then swap again to keep from getting trapped. Playing with 4 players really outshines a smaller player count because of this – 4 players will see a lot more aberrations hit the table, because more cards will be played. Unfortunately, where Paradise really falls is in the fact that success depends more on the luck of the draw than anything else. Sure, there are some moves you can pull off that will make you feel successful or clever, but clever moves don’t win the game. Drawing a variety of exploration cards will win you the game. It is far easier to navigate with limited resources if you have the exploration cards you need, than it is to explore with a boatload of rations but no exploration cards. Players who continuously draw Aberrations, Rations, and Aptitudes will not be able to slow down an opponent who draws Exploration cards. This is especially pronounced in the 2-player game. Sure, it’s possible that luck will turn and come back to you, allowing you to catch up, but the key is that luck makes you win more than anything. Most of the time, the loser(s) haven’t really been able to look back and say “man, I should have done THIS differently” because the only thing they could have done differently is draw different random cards. There are things you can do to mitigate this luck; you can discard cards from your hand at the end of your turn before you draw up to your limit, so you can clear out useless cards, duplicate exploration cards, or extra Rations you don’t need yet, but you still depend on luck to keep drawing exploration cards. Moving on. The components are, for the most part, pretty good especially for such a small box game. The cards feel durable, the islands are thick cardboard, not card stock (although card stock versions of the islands are included. I’m guessing the thick cardboard tokens are a kickstarted upgrade?). 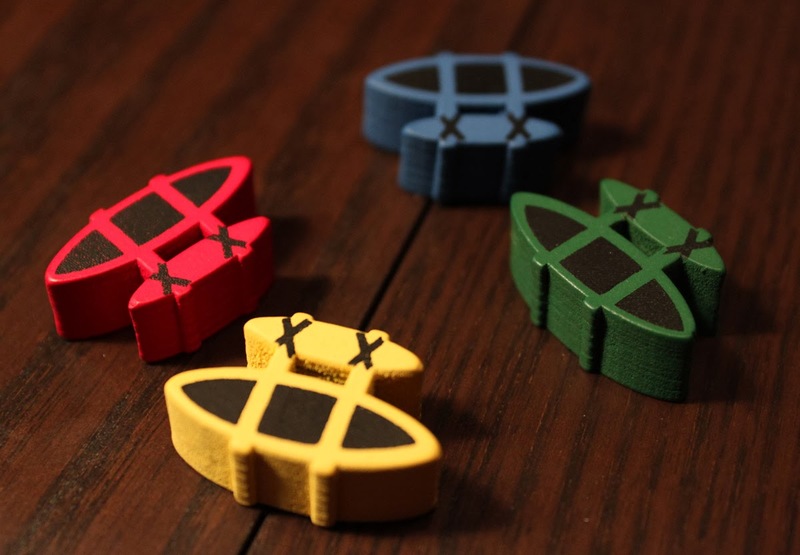 The Kanaloa tokens come with stickers that add a little charm, but you have to place the stickers yourself, which is a little tedious–especially as the sticker is the exact size of the token, leaving no room for error. I hope you have steady hands. Of course you have the colorful canoe-tokens, which kind of look like blimps if you turn them on their side. Let’s be honest, they look a lot like blimps. Not that this takes anything away from the game. Admit it. You thought they were blimps. If there’s one complaint to be leveled against the components, its that the artwork is very dark. And I don’t mean gruesome or serious; I mean the colors are dark. Mostly this affects the islands, but it makes the visual appearance of the board rather bland; the islands are just dark blobs that all blend together. It’s not easy to match exploration card to island by shape because of the darkness, and many of the island names are similar, meaning you’ll spend some time studying the words on your cards and then on the table to make sure you’re going to the right place. Oh, one more complaint about the design of the cards. This game uses icons heavily to convey the abilities of cards. Not every game can use icons exclusively; this game is not one of them. But it does anyways. Sure, you have a nice little icon cheat-sheet but most of the cards have a string of icons combined together to form some kind of icon sentence, and it’s not easy to interpret. In one game my wife simply just ignored exploration card bonuses because she couldn’t interpret them. In every game after that I offered interpretation of every card played; these cards could really have used the benefit of text descriptions, and should have stuck to a smaller icon set. It presents a barrier to entry for a game that should have none. Speaking of barrier to entry, the rulebook is okay, but there were a few areas I was unclear about after studying them, and I had to ask the publisher for clarification. Overall, Paradise Fallen is a decent, quick card game. The geographical element of the islands helps it stand out from other small-box card games, but the overbearing presence of luck in the gameplay will keep it from being a chart-topper. Still, a good portion of the game is fun to play, and manipulating the aberrations with your hand in order to score several islands at once will happen often enough to make you feel victorious and keep the game entertaining, at least for the twenty minutes it takes to play. And there is room in most game collections for such games. iSlaytheDragon would like to thank Crash Games for providing a review copy of Paradise Fallen. If I’d play, they’d definitely be blimps! I referred to them as blimps or zeppelins for the entire game of which I was a part. I insisted that they be turned up on their sides as well.